Fall down accidents comprise a large percentage of our practice. The White Plains accident attorneys at Worby Groner Edelman have years of experience in this type of lawsuit. We recently wrote on the topic of fall down accidents that occur indoors, in locations such as a supermarket. We noted that while a piece of lettuce or some other foreign substance should not be on the floor, that fact alone is insufficient to prove that the store owner is liable for your accident. Instead, you have to prove that the premises owner had “notice” of the dangerous condition. That means that you have to prove that the owner either knew that the condition was present, or that the condition existed for a sufficient length of time such that if the owner had exercised reasonable care and inspected the premises, she would have been aware that the condition was present. The same laws apply to outdoor accidents too, such as loose steps on an exterior stairway, or cracks on a sidewalk, but there is a twist. Most municipalities – cities, towns and villages – require property owners to maintain the sidewalk in front of their premises. For instance, some of these local ordinances require a property owner to clear snow and ice form the sidewalk in front of their premises within four hours after a storm. Similar ordinances require a property owner to maintain a sidewalk, even if it means fixing an unlevel walkway. 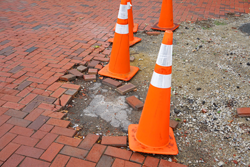 Whether that ordinance is fair or not – requiring a property owner that does not own the sidewalk and may not have caused the sidewalk to be in that condition to nevertheless repair the sidewalk – is a question for another day. The confusing part is that just because an ordinance requires a property owner to remove snow, or to repair a crack on the sidewalk, it does not automatically follow that an injured accident victim can successfully sue that property owner for damages in the event of a fall caused by the owner’s negligent failure to make the repair. The ordinance has to specifically confer that right before a property owner can be held liable under these facts. In our experience, there are some local towns and villages which permit this type of lawsuit, and some others that do not. As an example, New York City requires property owners to maintain the sidewalk in front of their property, including removal of snow and ice, and permits an accident victim to sue the owner for its failure to do so. However, the rule in New York City that permits a victim to sue for damages does not apply to one, two, or three-family residential real property that is in whole or in part owner occupied, and used exclusively for residential purposes. After it is determined that a lawsuit for a sidewalk fall is feasible against a given property owner under a specific set of facts, the analysis turns to whether that owner had notice of the condition. In theory, proof of notice for an outside fall is the same as proof of notice for an inside fall, but the facts are usually different in nature. For instance, one would have to prove that the snow and ice were present for a sufficiently long period of time such that the owner should have known of the condition. One might also have to prove that a sidewalk crack was in that condition for a sufficiently long period of time. As always, it is crucial that you make note of the pertinent facts involving your own accident. Where exactly did you fall, and what was it that caused you to fall? Where were you looking at the time that you fell? In addition, it’s a good idea to take a picture of the condition as it existed at the time of your fall. This is especially important in a snow and ice condition. Contact the White Plains accident attorneys at Worby Groner Edelman if you have been injured in any type of fall. We’ll explain the law and how it works in your specific case, and we’ll make sure to answer all of your questions. We have access to a full range of weather and engineering experts to help prove your case. We’ll try to settle your case, but we’ll simultaneously prepare the case for trial if the insurance company refuses to settle for what we believe is a proper number. There’s never a fee unless we recover money for you.